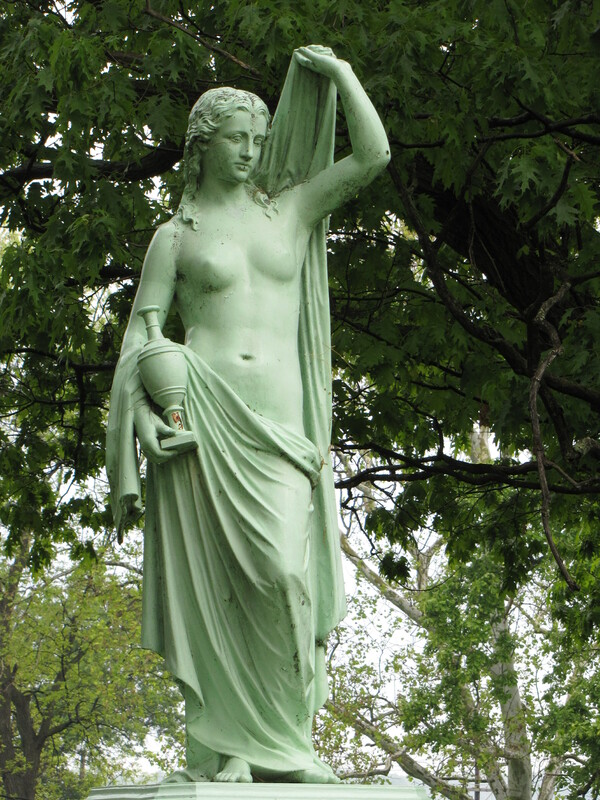 In the center of the Greenbush Cemetery at Lafayette, Indiana, is a monument erected to commemorate the dedication and founding of the cemetery association on February 12, 1848. The pedestal is topped with a classical bronze mourning figure. The figure holds an urn in her hand. The long narrow neck on the urn indicates that it may have been for collecting her tears; it could also be a cinerary urn. The cinerary urn is a container used to hold the ashes or the cremated remains of the dead. The urn was an almost ubiquitous 19th Century symbol found in nearly every American cemetery. With her other hand the mourning figure is lifting part of her garment over her head to form a veil. The veil represents the partition that exists between the Earthly realm and the Heavenly one–between life and death.